I have a personal relationship with CTS. And, I’m not alone. It affects one out of ten people during their lifetime and is the most common form of nerve compression. My first personal encounter with CTS was helping my father deal with it. He developed it severely in both wrists at age 82 building a deck, using power tools and hammering for about a week. After returning home to Canada, he had a nerve conduction study to prove it and was placed on a waiting list for elective surgery in three months. Since that was a long time to wait, I recommended that he use special, high intensity static magnets on each wrist. After about one month of doing this, most of the pain, numbness and tingling were gone and didn’t return. Surgery was canceled. My next encounter was even more personal; it happened to me. In late March 2018, possibly related to physical work I had to do using my wrists, I began having the same problem as my father, but mostly in my right hand. Working at my computer caused sharp burning, stinging sensations in my right hand. When I rested my wrist, it would go away. It happened every day, most of the day. During the night I would have almost complete numbness of my thumb and index finger. When the sensation started to return, I felt a burning tingling. I had continuous numbness at the end of my thumb. It was hard to button a shirt. With this set of symptoms, a typical person would go to a doctor and get medication and possibly be sent to an orthopedic doctor for a steroid injection. The next steps would be a nerve conduction study and possibly surgery. 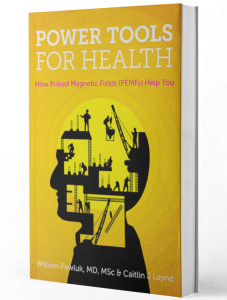 Because I knew magnetic fields could help with CTS, given my father’s experience, I began using a battery-operated, portable pulsed magnetic field (PEMF) device at 10 Hz and 200 Gauss, on my wrist throughout the day and night. In about a week the discomfort had decreased by about 80%, without drugs, injections or surgery. However, it was not all gone and would easily come back if I didn’t continue treatment and use a nighttime splint. Near the peak of the problem, about 3 weeks later in April, I had an ultrasound of my wrist that clearly showed swelling of the median nerve. That evidence should have qualified me for a surgical procedure. But, often, surgeons want to try steroid injections first. Any benefit from these is usually short-lived and have their risks. If you fail this step, then surgery is next. But, you have to prove that you qualify for surgery. This is done by getting a nerve conduction study. A nerve conduction study (poking a needle into a nerve) is very uncomfortable and is not always reliable. Nerve conduction studies measure how well nerves are functioning. In carpal tunnel syndrome when a nerve is significantly affected the studies are very abnormal. But, they can also be frequently falsely negative, especially in less severe situations. Insurance companies typically expect this test to be positive before approving treatment, even though they are not 100% reliable. So, I basically continued doing daily treatments with the PEMFs and my night splint. I believe the night splint is a fundamental necessity to keep your hand straight. If you don’t, you can wake up with a very numb hand during the night. After repositioning your hand, It can take what feels like eternity to get back to normal. So, a night splint is critical. I knew that combining static magnets at night in the splint along with PEMFs would provide the most benefit. I fashioned myself a small square from a sheet of aluminum duct, with six neodymium magnets taped on it. I slip this into my night splint every night over the carpal tunnel. After six weeks of doing daytime PEMF therapy and the nighttime splint with my static magnets, I am 99% free of discomfort. Occasionally when I’m working at the computer I will still get some burning sensation in my palm at the base of my thumb. The tip of my thumb is no longer numb. I still haven’t done the nerve conduction study, because at this point it’s not likely to show any abnormality, since I don’t have symptoms. I now also don’t need surgery or steroid injections. “The cross-sectional area (CSA) of the right median nerve, proximal to the aponeurosis (a fiber band that’s part of the carpal tunnel) measures 0.09 sq cm. Previous measurement (April 2018) was 0.14 sq cm. Measurements were obtained at approximately the same level. Maximum AP diameter on the sagittal images measures 2.8 mm versus previous measurement of 3.1 mm. Normal CSA is about 0.06 sq cm. In mild CTS it is about 0.11 sq cm. and severe CTS is 0.12 sq cm or more. This repaeat ultrasound report shows about 37% improvement of the nerve inflammation and swelling. Most improvement in my symptoms happened within a month of the previous study. Often, objective evidence of improvement lags behind clinical improvement. Now, I will only occasionally get very temporary tingling in my hand when working at the computer. My journey with carpal tunnel syndrome is not typical. The typical journey for most people who rely on conventional medicine includes steroid injections and/or surgery, because doctors don’t know about magnetic field therapies. I know many people, including patients, who have had the surgeries. Most have gotten relief. But, some haven’t. A few end-up with the same or new chronic problems. Some people who want to avoid surgery or steroid injections will use acupuncture, massage, physical therapy, laser therapy or electrical stimulation/TENS. Results from these therapies can be helpful but require getting care from other professionals. They are often not long-lasting either. Carpal tunnel problems tend to recur, as I know only too well, so, having a home-based PEMF device is a good idea and would also help the many other problems that PEMFs are good for. I took the magnetic therapy route because I wanted to experience firsthand the potential value of self treatment with safe, noninvasive, at home, convenient (relatively speaking) magnetic field therapy for carpal tunnel syndrome. Carpal tunnel syndrome (CTS) is a condition due to compression of the median nerve as it travels through the wrist at the carpal tunnel. The carpal tunnel is where the nerves controlling sensation and movement in the hand and fingers pass under and through ligaments on the palm side of the wrist. The median nerve controls the sensation of the thumb, index finger, middle finger and the thumb side of the ring finger. When the median nerve is pressed going through this tunnel it becomes irritated, inflamed and swells, causing the nerve to not function properly. The main symptoms are pain, numbness, and tingling in the thumb, index finger, middle finger, and the thumb side of the ring finger. Symptoms typically start gradually and occur often during the night. Pain may extend up the arm. A weak grip may happen and, if it persists for a long time, the muscles at the base of the thumb (thenar muscles) may waste away. In more than half of people affected with CTS, both wrists are affected. CTS causes not only compression of the median nerve, but also obstruction of venous blood flow, edema formation, and ultimately, lack of oxygen to the median nerve, nerve microcirculation injury, connective tissue compression, and thickening of the surrounding synovial tissue. The goal of therapy is to reduce the swelling of the nerve, improve circulation to the nerve and reverse the inflammation that’s part of this process. If the nerve is damaged, repair of the nerve is also important. More severe nerve damage may not be able to be reversed. So, starting treatment early is critical. Sadly, most people are not aware of this progression of these challenges or the risks and, as a result, start appropriate and easy to use treatments too late. This is one of the purposes of this blog. That is, it is to educate people that a simple home-based technology can make a big difference to their lifetime risk of harm from carpal tunnel syndrome. The treatment options normally considered for CTS are invasive and noninvasive, surgical and nonsurgical. These can include among others: oral anti-inflammatories, oral steroids, steroid injections, ultrasound, magnetic and electromagnetic field therapy, laser, ultrasound, acupuncture, electrical stimulation, nocturnal splinting, massage and physical therapy and the use of ergonomic keyboards and computer mice, and traditional cupping versus heat pads. The basic approaches include carpal tunnel release (CTR), either open (OCTR) or endoscopic (ECTR). Complications associated with CTR surgery include painful or thickened scars, bruising, infection, stiffness, swelling or discomfort of the wrist and, disastrous, reflex sympathetic dystrophy (RDS), also called complex regional pain syndrome (CRPS). There is a small risk from surgery for major injuries to nerves, vessels, or tendons. Recurrent and persistent CTS problems following OCTR can still be 10-12%. 75% of patients have excellent results from surgery, usually when followed short-term. That means that 25% of patients may get less than adequate results or have complications. Looked at in another way, one in seven surgeons report a median nerve injury among their cases. Some wound related symptoms may persist for 2 years after surgery. While risks are relatively low, if you are the one with the problem, it’s 100%. Surgeons tend to minimize the risks. Failures and complications occur with all treatment methods, including surgery. Outcomes depend on the skill of the surgeon, underlying health and age of the person, severity of the compression, duration of symptoms, degree of irreversible nerve damage, and success at removing causal factors. How effective are current treatments for CTS? Research evidence for benefit and effectiveness is moderately strong for oral steroids, steroid injections, ultrasound, electromagnetic field therapy, nocturnal splinting, and the use of ergonomic keyboards. Also, research shows moderate effectiveness for ultrasound over weeks to a couple of months. No long-term results have been reported. A major issue with most studies on non-surgical or noninvasive techniques is the ability to do treatment for as long as the patient needs until recovery. This means that most research studies follow people for a limited time and not until recovery. The same thing happens clinically. People will do treatment for awhile, whether on their own or with a practitioner, before they give up or stop. That means that many people end up getting surgery when they might not need it. A major limitation in getting treatment with a practitioner until recovery is the cost and inconvenience. Most people stop too soon or they get benefit and the problem returns, requiring another course of treatment. This results in a seesaw of treatments and temporary relief over extended periods, allowing the damage to progress to being irreversible. This cycle often continues if the factors causing the CTS are not removed. So, home-based magnetic field therapy, whether with static magnets or with pulsed electromagnetic fields (PEMFs), makes the most sense, considering cost-effectiveness and cost-benefit. What is the evidence that magnetic field therapies work for carpal tunnel syndrome? Magnetic therapy research has been conducted on both static, permanent magnets and pulsed electromagnetic (PEMF) devices. Most of this research found benefit. Static magnets have been used in research (Colbert) because of their ease-of-use, low cost and the fact that the carpal tunnel tissues involved are close to the treatment applicators. But, like other research into CTS treatments, there are often significant limitations in the studies. The take away from research using static magnets is that there is likely to be some benefit and that this benefit is likely to be greater with higher intensity magnets, when worn for longer periods during the day, used beyond 1 to 2 months and are best when used in a splint. It’s clear that more severe forms of CTS are less likely to benefit. As with my father and me, longer-term use is most likely necessary, especially if the extremity or extremities with CTS continue to be used, even for daily activities. What about pulsed electromagnetic fields (PEMFs)? The table below provides a summary of several studies done with various PEMFs. In general, PEMFs have provided significant benefits to people with mild to moderate CTS. PEMF treatments improved not only symptoms but also objective nerve conduction and muscle strength testing. Using antioxidants along with PEMFs probably would produce better results than either one alone. One important study compared PEMF therapy to surgery, demonstrating that PEMFs were at least equal to if not better than surgery. 15 for 2-10 months extra Deep pain 35% less vs 12% more in shams. With 10 mos rx better with NCT 40-53%; pain 50% and overall 70% PEMF vs sham PEMF. Mild-moderate Variable 1-80 Hz, 1 G 47 mins, 3X/wk X 12. T1=end of treatment;T2= 3 mos after T1. 40 G 1 hr, 4X/wk X4 PEMF and surgery better vs sham in NCT and symptoms. PEMF sl. better vs surgery: NCT 14-16% vs 12-14%; symptoms 34% vs 12-14% PEMF vs surgery vs sham. Most of the studies used relatively low intensity PEMFs, for short treatment times and over relatively short courses of treatment. When the courses of treatment were extended, results improved. This research corroborates my experience using a 200 Gauss 10/100 Hz PEMF for moderate to severe CTS. Because I was doing my own treatments, I could apply them for more extended periods of time per day and over a longer course of treatments. The study comparing PEMFs to surgery deserves a more complete description. (Ewidea) People with mild and moderate CTS were evaluated in a randomized, placebo-controlled, double-blinded study. Forty-five females were divided randomly into three groups of 15 each: sham exposure, PEMF at frequency of 50 Hz, and surgical intervention. The PEMF was given to the area of the median nerve at the wrist and forearm 4 days/week for 1 month, 50 Hz, 40 gauss for 1 hour. The outcome measurements were NCTs and Boston carpal tunnel questionnaire (BCTQ). Measurements were carried out at baseline and three months later. There were non-significant increases in test measures in the sham group. There were significant decreases of all measurements of both the PEMF and surgical groups versus sham and significant decreases of all measurements of magnetic group versus the surgical group. Specifically, the PEMF group had a 14 – 16% improvement in NCT scores versus 12 – 14% in the surgical group. For BCTQ scores, the PEMF group had a 34% improvement versus 30% for the surgical patients. When comparing the BCTQ scores statistically between the surgical group and the PEMF group, the PEMF group had a significantly better improvement than surgery. The results show that PEMF could be as or more effective than surgery in mild to moderate CTS in improving median nerve function and hand function. This study is even more impressive given that treatment was only for one hour at a time with a relatively low intensity PEMF and only about 16 days of treatment. Considering the risks of surgery and the potential for harm versus benefit, it seems from this study that PEMFs should be the first line of treatment. Surgery should only be considered for the most severe cases and when PEMF therapy has failed. The convenience and effectiveness of PEMF therapy and the lack of risk weigh heavily in favor of this particular approach. All of the above research suggests that magnetic field therapy, whether with static magnets or PEMFs, even applied over relatively short periods can produce significant benefits, even cure. None of the studies available and reviewed followed individuals to resolution of their symptoms. How long it would take to achieve resolution would depend very much on the particular magnetic field systems used, the severity of the condition, how long it has been there, how active the person was in applying the treatments, whether appropriate steps were taken to limit aggravation of the condition, age of the individual, and health factors, nutritional status, among others. Static magnets appear to be somewhat effective but the intensity of the magnetic system and the length of time they need to be worn will determine effectiveness. Higher intensity static magnets need to be used for the best results. Static magnets are less expensive. They can be easily placed in splints. Based on the principles of physics and physiology, PEMFs are expected to be more effective than static magnets. PEMFs have the additional advantage of being able to be used for many other purposes and allow the ability to reach deeper into the body to help many other health problems. While there are very few comparisons of PEMFs and other therapeutic approaches, at the very least PEMFs appear to be equal to or better than ultrasound and surgery and the benefits are are even better when combined with antioxidant nutraceuticals. Magnetic field therapy avoids the risks of injections, drugs and surgical procedures. Since surgery has a non-insignificant rate of complications and failure, magnetic field therapy should be the first line of treatment before these other approaches are used. Many other approaches such as laser, acupuncture, physical therapy, chiropractic, and others often provide only short-term benefit and are inconvenient. Magnetic field therapy, whether with static magnets or PEMFs can be conveniently applied for as long as is needed to produce results. Intense application is useful early and then is able to be applied as needed afterwards if there are recurrences. Which magnetic or PEMF systems should be considered for the treatment of carpal tunnel syndrome? Practicality, convenience and magnetic field intensity are the most important considerations. A local magnetic field applied over the carpal tunnel is the best approach. The PEMFs can be portable, battery or AC powered. AC powered PEMFs would require the person to be in one place for the course of treatment. Portable battery operated PEMFs allow people to be mobile. Most portable battery operated PEMFs have sufficient magnetic field intensities to allow longer treatment times. Longer treatment times with higher intensity PEMFs will be more likely to produce results faster. Even better results would be achieved by combining nighttime splinting, wrist exercises, concurrent static magnet and PEMF use and avoiding or reducing overuse. Concurrent use of antioxidants and nutraceutical anti-inflammatories help to speed and maintain recovery. It’s even possible that combining PEMF therapies with ultrasound and acupuncture would produce even better results, even though they have the inconvenience and possible cost of having to go somewhere for treatment. Aboonq M. Pathophysiology of carpal tunnel syndrome. Neurosciences (Riyadh). 2015 Jan; 20(1): 4–9. Ahmed A. Pulsed magnetic field therapy in carpal tunnel syndrome: a randomized, placebo controlled double-blind study. Bull. Fac. Ph. Th. Cairo Univ., 2010 Jan;15(1):101-107. Battisti E, Fortunato M, Ginannneschi F, Rigato M. Efficacy of the magnetotherapy in idiopathic carpal tunnel syndrome. European Bioelectromagnetics Assoc. (EBEA), 4th International Congress, 19-21 November, Zagreb, Croatia, 1998. Colbert AP, Markov MS, Carlson N, Gregory WL, Carlson H, Elmer PJ. Static magnetic field therapy for carpal tunnel syndrome: a feasibility study. Arch Phys Med Rehabil. 2010 Jul;91(7):1098-104. Ewidea M and Hamed H. Pulsed magnetic field versus surgery in carpal tunnel syndrome: a randomized, placebo controlled double blind study 2010 Jan;15(1):101-107. The Advanced Science Journal Feb 2015(1): 10-18. Kamel DM, Hamed NS, Abdel Raoof NA, Tantawy SA. Pulsed magnetic field versus ultrasound in the treatment of postnatal carpal tunnel syndrome: A randomized controlled trial in the women of an Egyptian population. J Adv Res. 2017 Jan;8(1):45-53. Weintraub MI and Cole SP. A randomized controlled trial of the effects of a combination of static and dynamic magneticfields on carpal tunnel syndrome. Pain Med. 2008 Jul-Aug;9(5):493-504.